I really hate Star Sports for not continuing to show the live match between Rafael Nadal and Tomas Berdych at the Masters Series Monte Carlo. But as usual it's Saturday and it's football day and I have no choice but to wait for the delay telecast. The first semifinal match between Roger Federer and Juan Carlos Ferrero was shown earlier on with a predictable victory for Fedex. Fererro did not fight like what he did in the quarterfinal match against Richard Gasquet. Now that Fedex is guaranteed a place in the final tomorrow, I can't wait for Nadal's win to setup a Battle of the Year between the two top tennis players in the world. It's a crucial game for Fedex in his quest to win the one and only Grand Slam that he hasn't achieve yet, French Open at Roland Garros. While I'm writing this blog, I'm actually following the live score on the Masters Series Monte Carlo's official website. Nadal started off with a fierce and convincing play. He punished Berdych 6-0 in the first set in less than 30 minutes! For your information, Berdych has beaten Nadal three times in their previous four meetings. The second set was a tight race with Nadal trailing Berdych from behind. 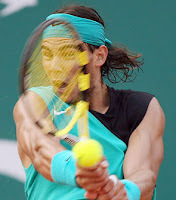 However, Nadal managed to control his game and won the semifinal match with the result 7-5. Hopefully Star Sports will be screening the final battle between Federer and Nadal LIVE tomorrow. Gosh, I can't wait to see it!